Thanks for posting this and the picture of your momee and her recipe. Of course!! Glad you enjoyed it!! Was your grandmother from Marksville? That’s very similar to the way my mother (Lucille Guidry Brouillette) made it. Yes! Both grandmothers were. Momee was a Kelone then a Broulliette. 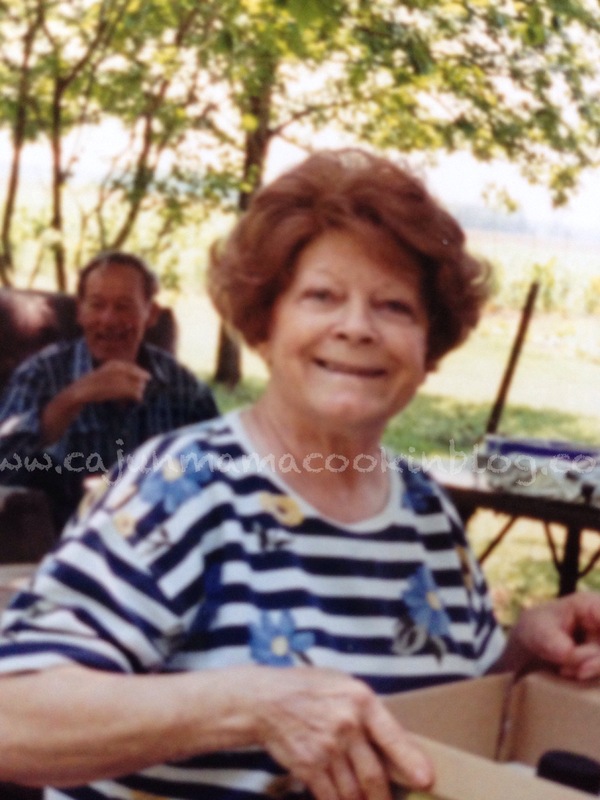 She lived in Broulliette and Momou was a Roy then a Mayeux. Lived in blue town. My Mother always put boiled eggs in her dressing and I always loved it! My husbands family does not and I found it strange at first. I guess it depends on one’s personal preference. This recipe is sooo like my Mothers! Enjoyed the story and thanks for sharing. Family is everything! If really is Rhonda! And I know it is so delicious! I made this last night because I had to have some. Yum! Thanks for reading!! Connie always put boiled egg in hers as well. I am also unaware if this is a regional or southern thing. While I don’t find it unusual to include the eggs, I think I am going to prepare mine without baking the eggs into it, but rather, serve sliced/boiled, or perhaps even poached, on the side. Reason being, we include a poached egg or sliced boiled eggs with a lot of our meals (i.e., we drop into soupes on the stove before serving, for example); Alex grew up in Germany and it was customary in his region to have an egg a day and not limited to the morning meal. For the past umpteen years I have strayed from traditional cooking when I opted to bring a dish to a family gathering (I enjoy introducing people to new foods or old foods cooked in new ways), but somehow now that I have Astrid, I would like to revive some of these cooking traditions in our house. 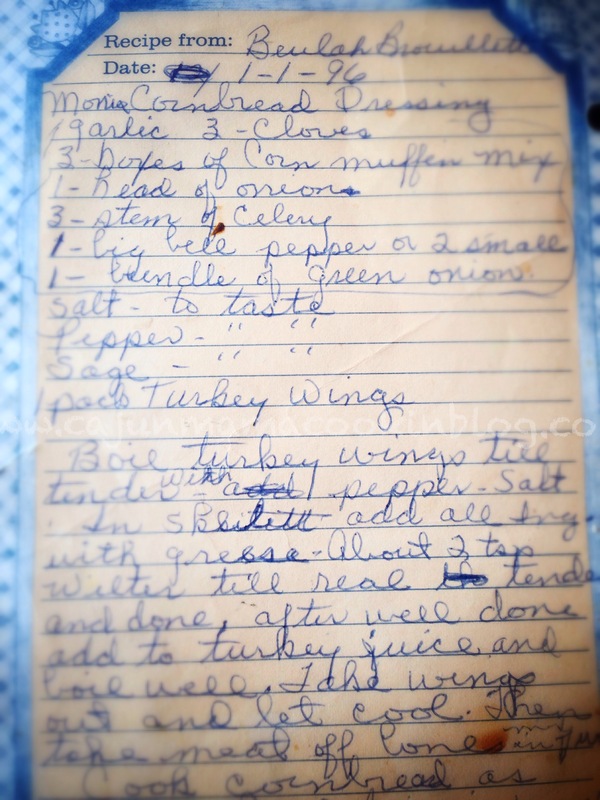 After reading this recipe, and seeing Beulah Mae’s smile and her handwritten recipe card, how can I not start with this one?! (I love the addition of sage; if I have access to fresh, I may try that). I did not realize that Beulah Mae was a Kelone. So, in other words, your ancestry is very German (Kelone, Zimmer, and Mayeux [originally Mayer but spelling Francofied later, to my knowledge]) with equal parts French (Brouillette) and Cajun (Roy [Le Roi, à Nouvelle-Ecosse]! Speaking of our Acadian roots, on Oct 10-12 in Lafayette, this year’s Festivals Acadiens et Créoles is going to be one of the best ever (40th year!). It is a super kid-friendly event with lots of delights and dancing of course. Would love to see you guys there! That sounds amazing cousin. I will see if we can swing it. Your comment is my all time favorite blog comment. Very awesome. I miss you.